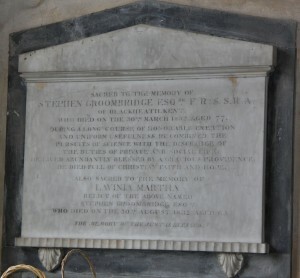 Stephen Groombridge was born in Goudhurst on 7th January 1755, the son of Thomas and Mary Groombridge. Apprenticed to linen-draper (Jeremiah?) Greenland, of West Smithfield, London, Stephen took over the business when Greenland retired. During this time he continued to live in Goudhurst where he is thought to have had a small observatory at the house now known as Pinehurst although no proof has yet been found to confirm this. Eventually, in 1802, he moved to 6 Eliot Place, Blackheath and lived there for the rest of his life. He continued in business in London while pursuing his astronomical studies in his spare time. He retired in 1815. 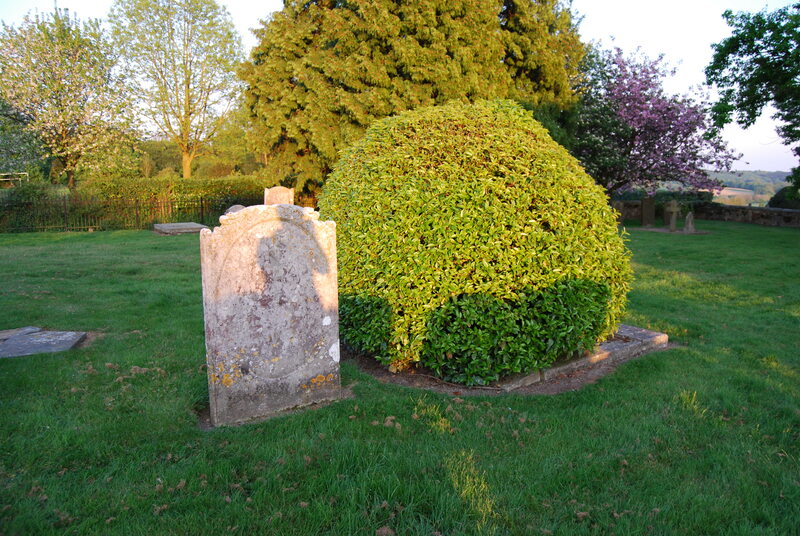 Groombridge died at Blackheath 30thMarch 1832 at the age of 77 and, was buried in Goudhurst on the 6th April. There is a memorial to him and his wife high up on the wall inside St Mary’s Church, and his grave can be seen in the churchyard next to those of other Groombridge family members. Groombridge is principally remembered today for his involvement in astronomy. In 1806, Troughton built him a telescope known as a transit circle which Groombridge then used to observe and catalogue the stars. His observatory at Blackheath was situated next to his dining room and it is said he used to interrupt his meals to take observations. In all he made over 50,000 observations which were published as his Star catalogue in 1832. He was accepted as a member of the Royal Society in 1812; an earlier application made in 1806 was withdrawn. In 1820 the Royal Astronomical Society was founded with Groombridge as one of the founding members. 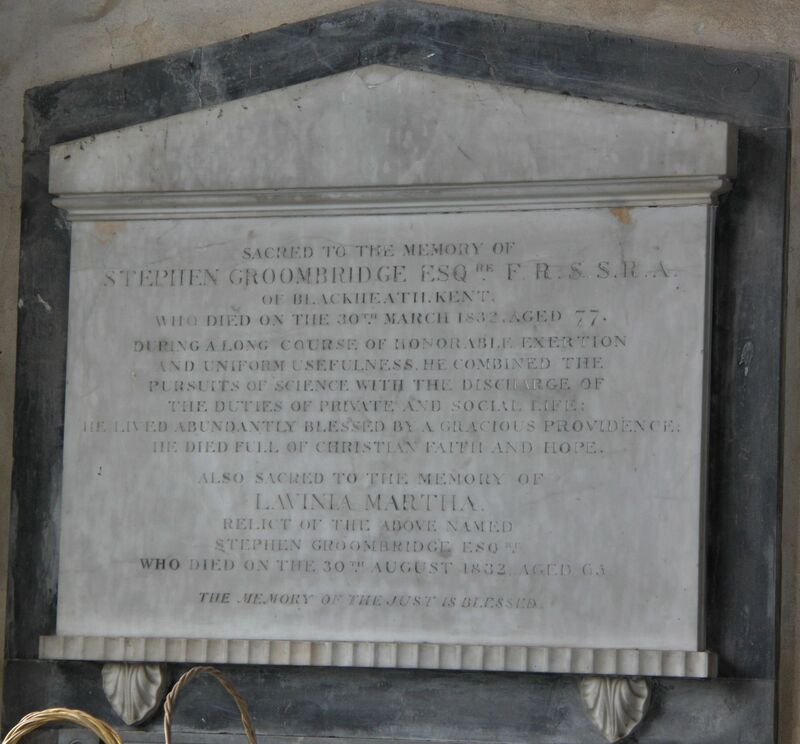 Groombridge married Lavinia Martha Treacher, by licence at St Bartholomew the Less, London on 24th January 1793. They had two children neither of whom survived their parents. Their son, Stephen Paris Groombridge, was baptised at St Mary, Lewisham in 1802 and died aged just 8 weeks in January 1803 and was buried Goudhurst on the 12th of that month. Their daughter, Mary Susanna, married the Reverend Newton Smart of Farley Hospital near Salisbury, Wiltshire. They had one son, named Newton Groombridge Smart born 4th August 1824. “I give and bequeath to such persons as shall be the Vicar and Churchwardens of the said parish of Goudhurst at the time of my decease the sum of £200 South Sea Annuities clear of legacy duty upon trust to receive and lay out the interest to due thereon, at all times hereafter in the purchase of twenty, sixpenny loaves to be distributed on the 3rd Sunday in every month …… amongst twenty poor Housekeepers of the said parish not receiving alms”. When his wife, Lavinia, died only 5 months after him on 30th August 1832, the Goudhurst property subsequently became the property to their young grandson Newton Groombridge Smart and since he was still a minor the estate was put into the hands of Trustees and Groombridge’s cousin, John Elliott, was appointed to collect the rents. The Groombridge property was still being administered at the time the Tithe map for Goudhurst was compiled in the early 1840s. The map shows that the estate was situated in the centre of the village at the top of North Road and the principal tenant appears to have been Samuel Beeching who rented the Oast House and buildings (now used by the Goudhurst Social club) and several fields in the vicinity. In later years this became generally known as “Beechings Farm”.